Each semester, Skema Business School requires students from all six campuses (Lille, Paris, Sophia Antipolis, Raleigh, Brazil and Suzhou) to complete an intense month-long course. Last semester, we completed a course on globalization, and this semester, on “Advanced Strategy.” In addition to in-class assignments, lectures and presentations, this course challenges students to create a strategy plan that could be implemented into the business model of the start up, Milanamos. 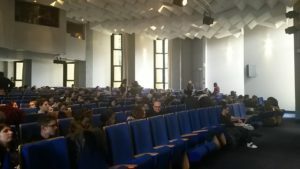 To help students have a better understanding of the company, Skema invited the co-founder and CEO, Christophe Imbert, to speak with the students. Christophe’s honorable mentions speak for itself: the company received the world innovation challenge 2030 award in 2014. Although it’s been sold to Sabre, Christophe still has control and successfully manages as CEO. In fact, in such a short period, the company has already expanded to serving 150 million passengers each year and 26 different customers. He hopes to expand to 100 customers within the next 2-3 years. Although their focus is currently on airlines, they plan to expand their expertise to rail, bus and road services, also known as the “multimodal” plan. This would allow for a seamless “door 2 door” experience for travelers. Eventually the company hopes to become the leading company in the European market and expand in Asia, the Middle East and the Americas. The presentation was very technical, because it was evident Christophe was very passionate about the project. The presentation was followed by 30 minutes of Q&A before students were released and able to go up and ask questions individually.